Having attempted "Dialing-in" this year's grid prior to St Pete with my IndyCar Grid report; Click Here Did we really learn anything from the season's first race? Other than we'd Thankfully finally gone racing again! Which were my sentiments 'Wayback in late March, prior to the season opening race at St Petersburg, Florida, as it looked like the "bowtie" was getting ready to Kick Arse and Take Names, as Honda came out with the woeful reply that they'd focused their Aerokit efforts solely on winning the prestigious Indy 500; Hmm? How'd that work out for Yuhs Hondre? As I've lamented before, the Bowtie Brigade seemingly has the stronger Driver line-up, especially 'El Capitano's four Musketeer's, as I'll be interested to see how 'Pageantry, aka Simon Pagenaud gels at Penske, and how he stacks up against his arch nemesis Will Power, while I'd definitely think 'HULIO's getting nervous (along with Montoya) over how much longer Roger keeps 'em? Yet Montoya's public persona is one who doesn't care and does things his own way, certainly his collecting of his second Borg Warner trophy has made life good for him, after giving Roger his record setting 16th Indy 500 victory this May. What a HELL of an upgrade! When I won the first time I got an Oldsmobile Aurora! Not to mention his wife receiving a brand new Bentley courtesy of Roger Penske, who promised his drivers to give their significant others said vehicle in exchange for another win at Indianapolis! When I was five in Kindergarten I had a Juan Pablo Montoya lunch box! How do you make Montoya mad? Call him Ron. What's the difference between Montoya 2000 and Montoya 2015? The Bra size! I don't want to remind how old Juan is, but when he won at Indy in 2000 I was a Freshman in High School and didn't have a Driver's license! Montoya has led the points standings ever since St Pete along with two-wins so far and could once again have the last laugh! As surely he enjoyed some small amount of satisfaction of defeating his former Boss Ganassi at Mother Speedway, no less, right? As for the other three members of Penske's Four Musketeers, reigning IndyCar champion Will Power has been second best, claiming the only other 'W for Roger thru Belle Isle, along with coming Oh, So close to winning at Indianapolis! As Power looks poised to go Back-to-Back in championships. And Y'all know my disdain for 'HULIO, so really can't say mucho 'bout the Dancin' Brazilian who made his 300th start at the Indy GP and had four podiums thru Toronto. 16 Rounds: 5 Road Courses, 4 Street Circuits* and 6 Ovals. 2nd: Will Power, Penske/Chevrolet; 3rd: Tony Kanaan, Ganassi/Chevrolet. 2nd: Helio Castroneves; Penske/Chevrolet; 3rd: James Jakes, Schmidt Peterson/Honda. 2nd: Helio Castroneves; Penske/Chevrolet; 3rd: Juan Pablo Montoya, Penske/Chevrolet. 2nd: Graham Rahal, RLLR/Honda; 3rd: Scott Dixon, Ganassi/Chevrolet. 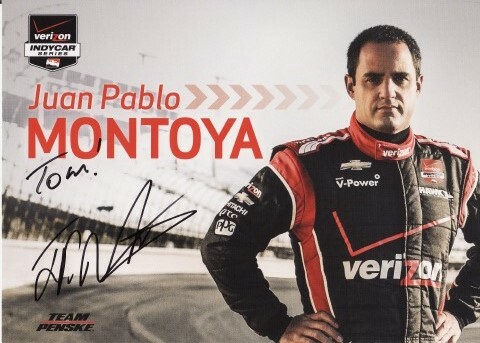 2nd: Graham Rahal, RLLR/Honda; 3rd: Juan Pablo Montoya, Penske/Chevrolet. 2nd: Will Power, Penske/Chevrolet; 3rd: Charlie Kimball, Ganassi/Chevrolet. 2nd: Marco Andretti, Andretti/Honda; 3rd: Simon Pagenaud, Penske/Chevrolet. 2nd: Takuma Sato, AJ Foyt/Honda; 3rd: Graham Rahal, RLLR/Honda.